Becycle Barre + Hermann Eicke-double shot. the local insta hero conquering berlin’s fitness scene, one studio and brunch at a time. My favourite thing to do at the weekend is hit a Barre class and brunch with friends. My life and work are fairly busy during the week, so the weekend is when I can really plan a proper double shot. combo! (i.e. a workout and then food!). My perfect Sunday morning starts with Sarah-Lynn’s Barre class at Becycle. I love every class she teaches and she works us hard! After class, I head straight to my new brunch spot obsession - Hermann Eicke - to catch-up with friends over good food and a lazy afternoon. U-BAHN: Bernauer Straße / Rosenthaler Platz. THE WORKOUT: Sunday 10.15am Barre class with Sarah Lynn. WHAT TABEA SAYS: Becycle is one of the best studios in Berlin to get the boutique fitness experience. The teachers are really experienced and the studio itself is lovely. Barre on a Sunday morning is always busy so I always make sure I sign up quick. It’s nice to see the same people in class every week - Becycle attracts a really loyal crowd. 10:15am might seem early to some, but I like to get up and make the most of the weekend. The class is usually pretty challenging. You may only work up a small sweat but your muscles feel the burn! By the end my ab muscles are aching and my legs feel like jelly! It’s really great training to work the finer movements and really target specific areas. I walk out every week with a smile on my face and feeling longer and leaner. THE FOOD: The Seitan Lunch Bowl and a Matcha Latte. WHAT TABEA SAYS: All my friends know what my go-to order at Hermann Eicke is the Seitan Lunch Bowl with Quinoa - I absolutely love it! They also do the best coffee in Berlin, with beans from Bonanza (the place is named after the inventor of the coffee machine, so it comes as no surprise that they serve up good brew). If you don’t drink coffee, try the Matcha Latte instead. The cafe is also a real neighbourhood spot. The owners are really friendly and get to know the regulars (like me on the weekends!). 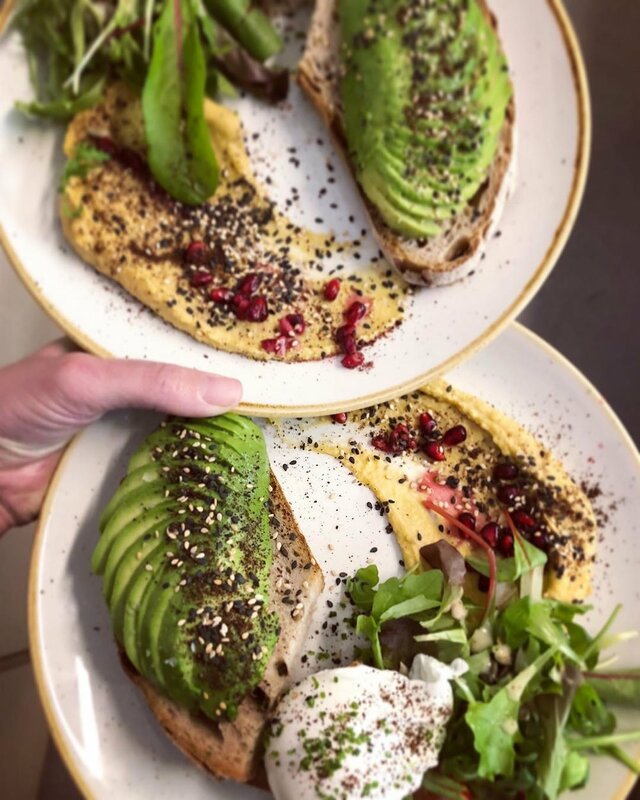 Other good dishes on the menu include the pumpkin seed bagel with fresh smoked salmon or the classic combination of poached eggs on sourdough with avocado and homemade sweet potato hummus. For a lighter option the Bircher Muesli overnight oats are homemade, super creamy packed with cranberries, pear, chia and sweetened naturally with honey. And don’t miss out on the home-made cakes. They often have little mini-bites of brownies or “healthier” power balls you can try which are perfect if you want something small to satisfy your sweet tooth. Otherwise get yourself a proper slice - it’s Sunday after all! THE PRICE: A drop-in class at Becycle is €23. An unlimited six weeks is €199 (can be purchased once only) or a pack of ten classes is €199. Its also available on Urban Sports Club XL membership. Brunch: Seitan bowl €10, Poached eggs and avocado €9, Salmon bagel €4.4. Coffee and cakes: Flat white €3.2, Matcha latte €3.9 mini brownies €0.5, cookies €1.5, power balls €2. Proper brownie €2.4. BEST FOR: A super satisfying Sunday morning with friends. Get Sparkle Your Way on the Gram. Sophie Heywood 7 February 2019 Crossfit Grenzgänger, Reinhardtstraße 29, 10117 Berlin.